For more than a decade, Jeff Capell has put up public fights over nearly every tax hike or spending project in Hamilton County: stadiums, jails, sales taxes, park levies, streetcars, red light cameras. His fiery speeches and scathing tweets are notorious, because he’s not afraid to hurl insults at anyone or anything that he believes is wasting taxpayer money. Just this month he’s called Cincinnati Zoo Director Thane Maynard a “terrible leader,” the city’s streetcar a “sh*thole project” for cold weather closures, and Cincinnati City Council members “fiscal phonies” for approving FC Cincinnati’s stadium project. Capell is a gadfly. A government watchdog. And a pest. So it came as somewhat of a shock that in December, Capell became the very thing he criticizes the most: an elected leader. But that changed when Capell, who has lived in Blue Ash for 14 years, became frustrated that city council was subsidizing a local golf course with tax dollars and taking trips to Germany on the public dime. He decided to run for office himself. In November, Capell defeated a 17-year incumbent to win a seat on Blue Ash City Council with more than 56 percent of the vote. Now, as Capell transitions from a citizen activist to a city councilman, he is learning the delicate art of diplomacy. Some local leaders who have been on the receiving end of Capell’s criticism over the years are quietly enjoying this change. “It has been fun, I think, for all of us to have some gentle barbs with Jeff now that he has become an elected official - now that Jeff is the establishment,” said Hamilton County Commissioner Todd Portune. Over the years Portune and Capell have been both allies and opponents on various issues. And Capell was a frequent visitor to county meetings, where he often attacked spending projects. Nowadays Capell may be known for his staunch, pointed opposition to FC Cincinnati’s quest for a new stadium to win a Major League Soccer bid. Last May he created a new anti-tax group, No More Stadium Taxes, to stir up opposition. He formed the group with attorney Tim Mara to fight any plans to use public dollars for a soccer stadium for FC Cincinnati, stadium improvements for the Bengals or renovations to U.S. Bank Arena. Not surprisingly, he became very unpopular with FC Cincinnati fans, who booed him at public meetings and attacked him on social media. Capell just ignored them, he said. An activist, especially one who's been around for a decade, can’t have a thin skin. He first entered the public fray in 2007 to fight against a sales tax hike for a new Hamilton County jail and safety programs. Voters ultimately rejected it by a landslide. After that first victory, Capell was hooked. From there, he fought against red light cameras in Cincinnati, the streetcar, and the city’s sale of its water utility. He campaigned to drop Music Hall from the icon tax in 2014, and helped defeat a city parks levy in 2015. But through it all Capell never yelled or screamed in public meetings, and was always respectful, professional and consistent, Portune said. The Mann/Murray/Smitherman tax hiking two-step: 1) empty your savings for a stadium project to benefit a few billionaires, claim it won't raise taxes; 2) Raise taxes next month when something important needs funding. Capell spent nine years as a board member of the political group Coalition Opposed to Additional Spending and Taxes, or COAST, before resigning to run for Blue Ash Council in 2017. He didn’t want to be accused of being an advocate for the group if he got elected, he said. That’s because in 2012, Capell filed a lawsuit with COAST to reverse the sale of Cincinnati’s Blue Ash Airport land to the city of Blue Ash. Over the years he has been a vocal critic of Blue Ash government. But so far on city council, Capell seems to be working well with everyone. 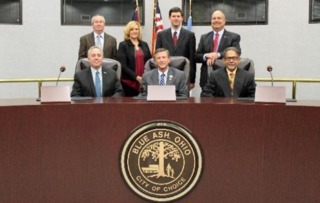 Jeff Capell and the new Blue Ash City Council sworn in on Dec. 1, 2017. Now that he’s a councilman, Capell has toned down his activism -- and his rhetoric. He is also learning to compromise in an effort to represent all of his constituents. But Capell doesn’t want to change entirely now that he’s in a position of power. He is still a champion of transparency in government, and not doing deals behind the scenes.